Hello guys, Extreme Codez Android App v2.0 is a simple app that let you access our site Quick and easily. get latest updates faster and notifications on recent post, it also have access to full site. experience the beauty of easy access to Extreme Codez website. Our android app has a lot of features that might interest you with our app you can easily translate any post on the site to your choose of country. You can also contact us easily using the help option and also send us feedback regarding any issues you find on our site or on the app the option of help and feedback can be located on the settings section. One best feature about our android app is that you access every thing within the app. You can also download any file right inside the app. The app also have less ads very neat and easy to use. launch App to access Full website And get latest updates. 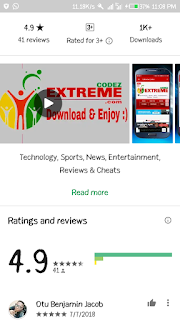 Extreme Codez is An technology site that gives you current updates, on Technology, Sports, News, Entertainment, Reviews, and Cheats. You can download on app note that app requires internet connection App for online reading and enjoy live whilst connected to the internet, and feature search, share and zoom tools. Stream YouTube videos on app. Extreme Codez is a News Platform that centers on InfoSec, Cyber Crime, Privacy, Surveillance, Dark Web and Hacking News with full-scale reviews on Social Media Platforms & Technology trends. » You can comment and reply to posts directly from the app without it bouncing back and at the end your comment won't be delivered. All the issues are fixed. » You are free to comment and reply to posts using this latest version. » It doesn't lag or eat your phone's memory / RAM. » You can browse our blog in just one click without opening a browser. » You will never miss our updates cos all Recent Updates is there for you and also Last 24 hours which shows the daily posts on this site. » The app is very fast in browsing our site even in poor connection/locations. » You will be able to download any app posted on this blog directly from our app, you will see your download progress in the download page. » You will love this new version. You will get a notification for any new post once you open our app. » There are more features which will be left till you download our Android app. Kindly go to Google PlayStore and update Extreme Codez App if you already have the previous version on your phone. But if you don't have our app yet, just go to Playstore and install it. 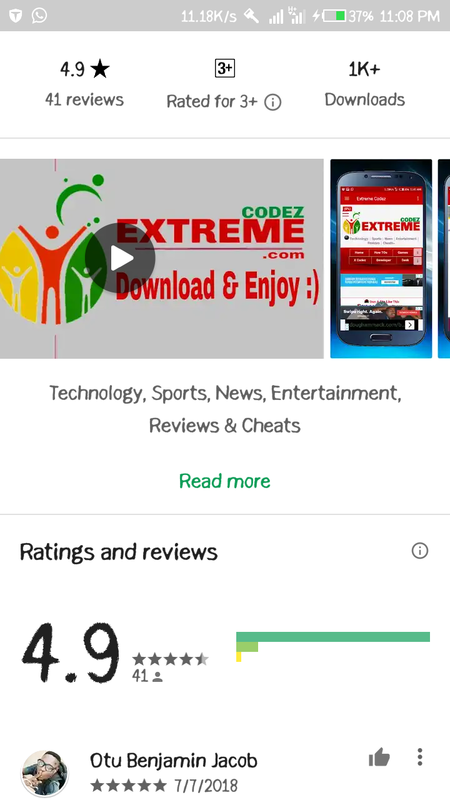 Search for "Extreme Codez " on PlayStore without quotes. We would love you to give our app a 5 star ratings on Playstore. www.extremecodez.com we extremely gives you the best!! !